Chapter 6 from the book Women and Popular Music: Sexuality, Identity and Subjectivity by Sheila Whiteley. By the late 1960's, folk singers Joan Baez, Buffy St Marie and Judy Collins had established solo careers, and in 1971 Carole King emerged as a performer on her highly successful album Tapestry. Its promotional single 'It's Too Late/I Feel the Earth Move' topped the charts, while 'You've Got a Friend' became a no. 1 hit for James Taylor, who also played on the album. It won four Grammy awards and remained in the charts for four years. Janis Ian ('Society's Child') and Carly Simon ('You're So Vain') were also enjoying success as solo artists, while Laura Nyro's 1969 album New York Tendaberry provided a brilliant example of jazz/rock fusions. It seemed, then, that the early 1970s was a propitious time for women to break into the solo market. Yet, as Joni Mitchell's album Blue reveals, being independent, creatively single minded and original continued to raise problems, not least those of grappling with a career while, at the same time, maintaining relationships. In contrast to her earlier work, where she sings narrative songs about made-up people, Blue places her firmly at the centre of her story. It was obvious from her first albums, Songs to a Seagull, Clouds and Ladies of the Canyon that Mitchell (born Roberta Joan Anderson, 7 November 1943) had an ability to draw on her personal experience and then translate this into a musical idiom. Her marriage to Chuck Mitchell is traced in 'I Had a King' from her debut album, and her subsequent affairs underpin the thematic content of her albums, in particular opening out the concept of freedom and the problems inherent in not becoming too involved with lovers. Of equal importance, she exemplifies the singer songwriter who got there by her own efforts, and whose albums demonstrate an increasing level of artistic and technical control. the imagery of the first four lines is not dissimilar to the cotton-candy of Jimi Hendrix's 'Spanish Castle Magic'. But here the comparison with psychedelia ends. There is little sense of the hallucinogenic. Rather, the lyrics overall read like a thoughtful evaluation of relationships, a coming to terms with life rather than an escape from reality. The vocal delivery is distinctive and clear, with the highs and lows of the melody reflecting the imagery of the lyrics. and reflective tied notes which are coloured by the shifting instrumental harmonies of effect a musical metaphor for the transitory nature of clouds, love and life itself. 'Both Sides Now' thus implies a truthfulness, a connection between the 'who I present and who I am' in its exploration of the personal in everyday life. The pacing of the song, the plateaux, the focus on change itself allied to the gentle ebb and flow of the supporting harmonies are far removed from either the timelessness of hallucinogenic songs of the period, or the thrusting urgency of contemporary rock. The vocal delivery, in particular, aligns the feminine 'who I am' with transitive experiences of the lyrics. Mitchell's wide ranging melody (octave plus perfect fourth), the clarity of her top register, the resonant lows and the overall flexibility in intonation are the most obvious points of reference. More specifically, her vocal style provides a metaphor for the highs and lows, the personalised experience of love and life as narrated in the lyrics. This alignment between lyric content and a deeply personalised vocal delivery suggests a self-involvement which is, at one and the same time, extraordinary and - at least for some listeners - disturbing in its range of power and register. In particular, the lyric's constant emphasis on I involves 'motion, perception, reflection, separation/connection, materiality, process, relationality'  and her aural impact is one of truthfulness to experience. It is about self-recognition, but she remains bombarded by contradictions which are picked up in her next solo album, Blue. 'All I Want', the first track on the album, begins quite simply by setting the scene 'I am on a lonely road and I am travelling, travelling, travelling.' Melodically, the phrase is narrow ranged, the iterative structure underpinning the anomie, the boredom, and the pressures of being on the road. The 'looking for something, what can it be?' then, provides a certain ironic twist. Mitchell knows what she wants ('applause, applause, life is cause') - but the road is typically male territory - and the personal cost of pursuing a creative career creates emotional pressures. In particular, there is a tension between freedom and dependency which comes across in the spontaneous outburst 'Oh, I hate you some ...' where the pitch rises on hate, following the natural inflection of the voice, before the reflective 'love ... you some'. Here 'love' is mused over, given time and coloured by a minor tonality which draws it into association with the 'travelling' of the first phrase to create an underlying bluesness, a realisation that the cost of dependency is Self, and the recognition that relationships only work when 'I forget about ... me'. In a song which concerned primarily with self-reflection and coming to terms with 'all I want' (from life and relationships), it is unlikely that the omnipresent I can be so easily dismissed. After a momentary pause, the me triggers a stream-of-consciousness needs which are again tempered by a mood of instability. The 'I want to be strong' for example, is compromised by the Bb minor on 'strong' to create a feeling of self-doubt, and underling insecurity. Travelling the lonely road takes strength, but as the song progresses Mitchell stakes out her needs - 'I want to laugh along, I want to belong to the living. Alive, alive, I want to get up and jive', etc. and while the contemplative 'I want to belong', 'I want to renew you again and again' suggests a certain cri-de-coeur, this is undercut by the challenging 'Do you want to dance with me ... do you want to take a chance ...' where, once again, internal rhyme draws thoughts and ideas into association. Musically, the song works because Mitchell's careful use of harmonic colour and melodic contouring act as word-painting for her emotional outbursts. The reflective 'Do you see how you hurt me baby' is underpinned by blunt, major tonalities. 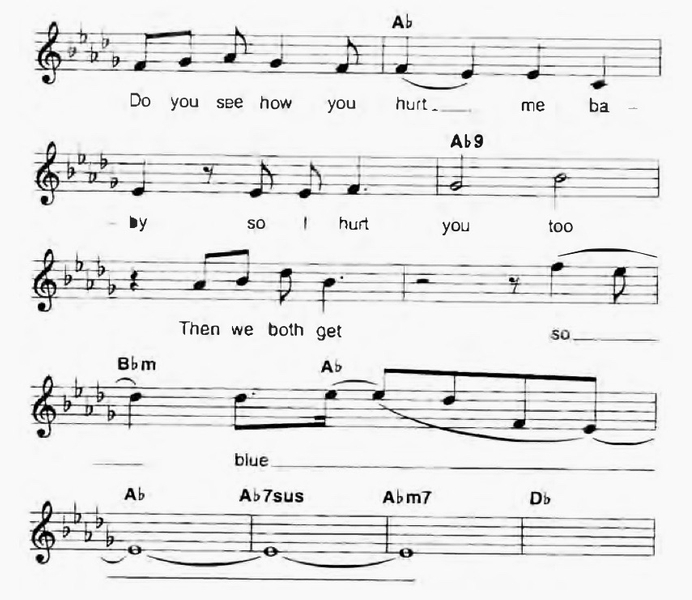 In contrast, the 'hurt you' is given time, both in the move to minims and the use of added colour in the Ab9 chord. The final phrase 'then we both get' draws pain into a shared experience by the avoidance of gendered coding (the defining major/minor third and its traditional associations with male/female) before an effective use of contemplative silence and the move to the climactic high on 'so'. The falling vocal contour on 'blue' then effects a musical metaphor of instability which is enhanced by the shifting harmonies in the guitar accompaniment, with the final Abm7 providing a pivotal bluesness before the lonely road of the final verse. before the harmonic progression back to the tonic, A major. Even here, there is a sense of fragile insecurity, for although her lover returns ('then he comes home'), the displacement of accents, the vocal leaps and the E7sus on 'home' paint a feeling of wistfulness. This is equally implied in the fade out at the end of the song where the alternating major/minor tonalities resonate with the omnipresent bluesness of dependency. 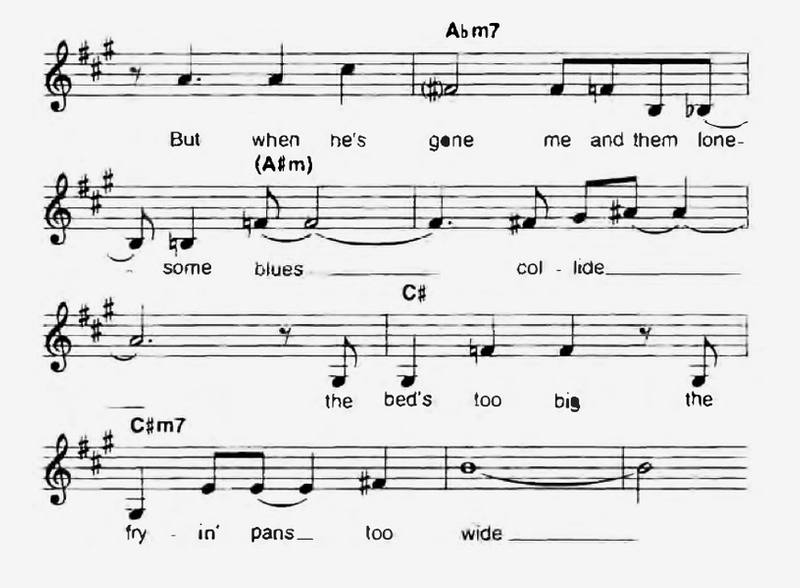 The tensions inherent in dependency/freedom are developed further in the third song, 'Little Green', a lullaby to Mitchell's only child who was surrendered to adoption. It is interesting to contrast this mother-to-daughter song with 'Eli's song', a father-to-son song by country artist Jack Williams and sung by John Denver. Traditionally, theories have been posited that feminine modes of self-expression are characterised by an intuitive, figurative, more 'felt' lexicon than masculine modes which may be more coldly rational and concrete . This is illustrated by the state of fact in 'Eli's Song' (Born in the month of June) and Mitchell's allusion to the astrological 'Age of Aquarius' in 'Little Green' (Born with the moon in cancer') which is rich in iconography with the moon linking the child to the sexuality of the mother, fertility and birth, Maiden and Mother. The child is, by analogy, the young goddess, the new moon, surrounded by the vibrant colours of spring - 'Just a little green like the colour when the spring is born' - and the endless cycle of life itself - 'There'll be icicles and birthday clothes'. While 'Little Green' is primarily a poetic and highly personalised song about Mitchell's relationship to her child, it equally provides a particular insight into the problems surround the single mother. As Mifflin writes: 'To be pregnant and unmarried in 1964 was like you killed somebody ... Joni allowed her daughter to be given up for adoption and then relocated to a one bedroom billet in Manhattan's Chelsea district. ' As such, the underlying poignancy of 'stay, baby' ('My Old Man'), with its restless harmonic instability locks into the starkness of 'He went to California ... He sends you a letter and she's lost to you' to create an articulate musical express of loss. At the same time, the song constructs a mood of underlying resilience ('You're sad and you're sorry but you're not ashamed') which, in its avoidance of the personalised 'I' implies a certain emotion distancing. 'Little Green' is situated within a qualitative experience of time - conception, birth, beginnings, endings. She may wish her child 'a happy ending', but the song nevertheless closes with the reflective 'sometimes there'll be sorrow'. There is, then, no easy solution, rather a continuing engagement with the ups and downs of life, the tensions between stability and freedom - a theme which is also present in the next track 'Carey' where the iconography surrounding the moon (and its relationship to the feminine) is replaced by the star. The transitory nature of the 'good time' are brought into association with Carey - 'the bright red devil who's keeping me in this tourist town'. Here, the implications staying/leaving are again focused by Mitchell's characteristic swoop to her top register which, in context, triggers a distress signal. This lack of stability is tooted in the conflict between 'Carey' and the fact that this is 'not my home'. Again, there is word-painting. The melody is musically centred Db (the tonic, the home key) but the word 'home' sits uneasily on the chord of Ab7 (the dominant) to effect musically a lack of resolution in the I-V cadence . Carey, himself, is described as 'a mean old daddy', although it apparent from the harmonic underpinning that Mitchell feels out of her depth. and, as the hip phrase of the 1970s 'out of sight' implies, while he has 'blown her mind' her is, nevertheless 'out of her league'. - the 'everyone is saying that hell's the hippest way to go' resonating with the deaths of Joplin, Hendrix, the death of optimism. It is also a recognition of defeat, of loving someone but being defeated by circumstances. She is 'at sea' with her emotions, torn between staying and leaving ('crown and anchor me, or let me sail away') but there are no answers in this soliloquy to pain. Rather the song opens out the problems, the price that is paid by those who are/were 'on the road' and this sense of anomie, this bluesness, links the song with 'California' which picks up on the continuing war in Vietnam, the dream of peace, 'the bloody changes' juxtaposed with the 'pretty people' in Spain 'Reading Rollin' Stone, reading Vogue'. which creates a musical alignment between the 'what he did for me' and the 'why' of loss. The introspection of the lyrics, the underlying pain, is realised partly in the formal tensions of the music itself. The narrative of loss is rooted in repetition, the need to escape by upward movement, chord colouring and a lack of resolution. 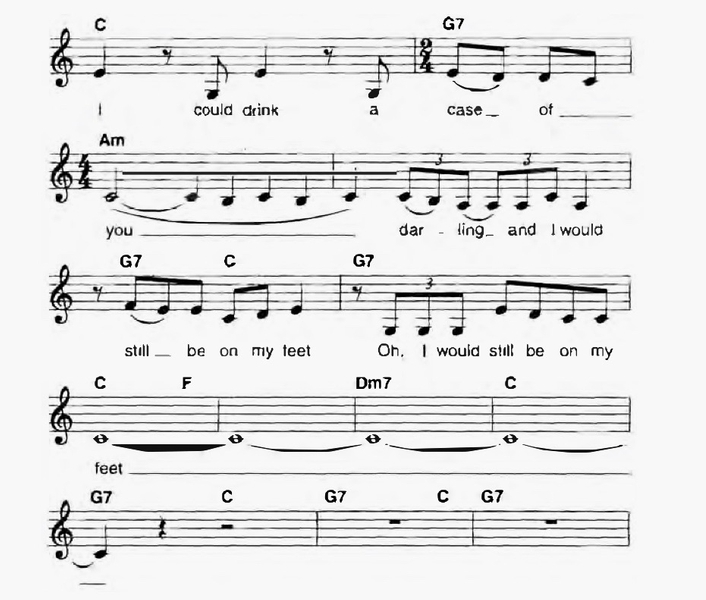 The final chorus, 'I wish I had a river I could skate away on' and the reappearance of 'Jingle Bells', twisted harmonically as a musical metaphor for self-reproach ('I made my baby cry'), ends with a stark perfect fifth over D (D7 omitting the F#) to provide a final and reflective coding of emptiness. Even here, however, Mitchell does not talk of returning to her lover. Rather there is the implication of skating even further away. acknowledging her selfishness, her pig-headedness, but aware that if she were to 'go to him, stay with him', she should 'be prepared to bleed', to accept compromise. In 'Richard', the final, anti-climactic song of the album, the implication of compromise are given a specific focus. Blue, then, is like a cycle of songs that has no real beginning, no real end. Rather the piano outro to 'Richard' with its somewhat desolate final chord returns the listener to the lonely road where the album began. What is evident, however, is the fact that behind the experience of the songs lies the reality of the choices Mitchell had to make if she were to achieve her ambitions. In that she was a pioneer, actually enjoying the same rewards as men both financially and in terms of personal freedom. But unlike men, she has a female tradition behind her which sits on her shoulder and whispers, 'Capitulate.' If she is lonely, it is because she refuses to give in ... and ultimately it is the little devil in her ear that is the problem ... once other women learn from her and catch up she will nor longer be the only woman with attitude . Nearly three decades after the release of Blue, Mitchell remains a significant force in popular music, having influenced artists as diverse as Annie Lennox, Prince and Seal. Her legacy is to focus attention on the personal, to express freedom of choice, to admit mistakes, unhappy love affairs, involvements with weak men, rough men and to move on - 'no regrets, we just come from different sets of circumstances'. Her strength lies in her pragmatism. She was/is a realist who accepts change, a 1970s' woman who chose her lovers, accepted pain and bounced back. Her self-exploration anticipates the post-feminist emphasis of the 1990s, not least the importance for women to know, accept and explore personal feelings, to 'bridge the gap between mind and body, reason and emotion, thinking and feeling' . It is a personal experience that is communicated with wit and intelligence and has certainly proved an inspiration for me. It is always helpful to get constructive feedback from friends and fellow academics and I am especially grateful here to Mary Routh (School of Media, Music and Performance, University of Salford) and Dr John Richardson (South Bank University, London), author of Singing Archaeology: Philip Glass's Akhnaten, Hanover and London: University Press of New England, for personal insights from which I quote freely. I would acknowledge the thoughts here of my friend and colleague Mary Routh whose feedback on my first draft provided many provocative and significant ideas that have been incorporated into this chapter. Thank you, Mary. Interview with Joni Mitchell. Makeove, J. (1989) Woodstock, London: Sidgwick and Jackson, p. 23. Rycinga, J. 'Lesbian Composition Process: One Lover-Composer's Perspective', in Brett, P., Wood, E. and Thomas, G.C. (eds) (1994) Queering The Pitch. The New Gay and Lesbian Musicology, London: Routledge, p. 284. It is not suggested that Mitchell's compositions indicate a closet lesbian, rather that Rycinga's identification of motion, perception, reflection etc. has relevance to the compositional approach of the song. I would also refer here to Elizabeth Wood's article 'Sapphonics' (also in Queering the Pitch) which provides an interesting discussion of the ways in which women's voices cross the thresholds of register in a way that challenges the established order. As my colleague John Richardson observes, vocal and, particularly, instrument virtuosity is a transgressive element - particularly for women performers - and the extraordinary range and power of Mitchell's voice quite literally upsets some listeners. John Richardson has also contributed some relevant points on Joni Mitchell's alternative tunings which he interprets as a possible search for a different woman's voice. As he points out alternative tuning also become alternative in a wider sense. It is true that people like Dave Van Ronk, David Crosby and Neil Young used similar tunings, but not with the same musical results. Mitchell herself cites Elizabeth Cotton, a black woman, as having influenced her guitar playing style, and not so much men who were working with alternative tunings at the time. Pat Metheny's frustration with Mitchell because of her use of alternative tunings (and her inability to categorise the chords) appears to lend support to the idea that these tunings are truly alternative and annoy people because of this. John also notes that Suzanne Vega's unorthodox guitar style, although different to Mitchell's (Vega picks rather than strums) works in a similar way - as resisting the prevailing conditions. Thanks, John. In folk music, most instruments are acoustic and portable. The important point here is that they can be carried around. As such there is an analogy with the artist's sketch pad in that they can access the immediacy of the moment through the equivalence of a thumbnail sketch. Mifflin, M., 'Barefoot and Pregnant', in Keyboard, p. 14, col. 3. Mitchell's choice of guitar (as the accompaniment to a song) reflects her folk background. It also has strong associations with travel, the hippy lifestyle that was so significant to the late 1960s. Again, I thank Mary here for her traveller's insights and the association of the riff with Stephen Stills' 'Marrakesh Express' which again highlights the exotic of travel. Tonic to Dominant (I-V) cadences are associated with an interruption of expectations, a lack of resolution which is generally brought about by the reversal of the V-I progression. Chord 1 is the harmonic 'home' of the diatonic scale and the V-I cadence implies finality. As such, Mitchell use of the chord V on the word 'home' has an underlying irony in its musical implications of moving on. This article has been viewed 4,925 times since being added on October 9, 2018.